1. Flatten piece of clay to about 1/4" thickness. Use rolling pin or a slab roller. Cut slab to desired dimensions. Ahead of time prepare clay coils by hand or with an extruder. Make sure your pre made clay coils are covered with plastic to keep them soft - coils dry out very quickly! 2. Score and slip slab and lay the first layer of coil. Push the coil firmly into the slab. Cut first layer of coil as illustrated below to insure perfect fit around the parameters of the slab. Remove the unused coil pieces and blend the joint. Pinch / scrape the coil with one finger into the slab smooth using your finger, a rib or a wooden tool. 3. Smooth the outside using a rib. We use Sherryll's Mud Tools red rib. Place the next layer of coil, pinch and smooth and in previous layer. 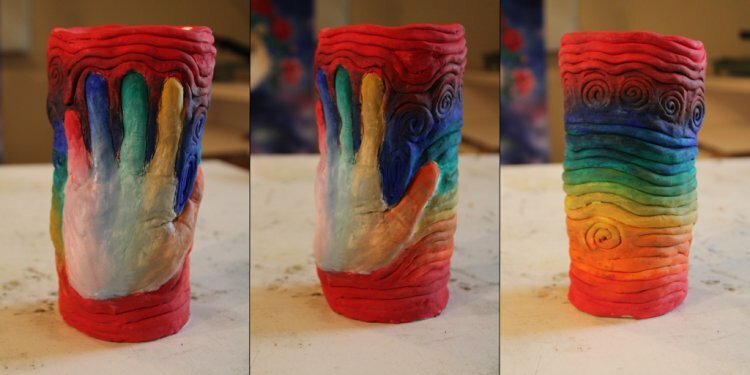 When merging two layers, make sure that one hand is supporting the clay on one side while the other hand pushing / smudging the other side. 4. Keep adding layers. You can add up to three at a time before blending and smoothing. When cutting a coil to fit, make the cut in a different place to insure that two joints are not directly one above the other. 6. Use the same method as above to create the pot's rim. You may choose to leave the rim "un-smoothed" as illustrated below. If making a large pot, it might be too soft to hold it's full weight. Cover it and allow it to set for a while before proceeding. When starting again, the next coil added MUST be slip-and-scored to the existing pot. 7. Use a paddle to both shape the pot and strengthen the coiled wall. Dry slowly by covering the pot loosely with plastic before Bisquing.